9333 E Nacoma Dr in Sun Lakes, AZ has just been listed for sale in Sun Lakes Oakwood Country Club. This home is an expanded Palacia floor plan with 2,123 square feet with three bedrooms and two baths. 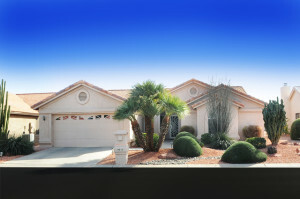 This home has great curb appeal and lush mature desert landscaping. Enjoy the newer appliances, granite counter tops, refinished cabinets, updated master bathroom and new carpets in the bedrooms. The wall was removed to open the family and living room into one large great room with a view of the lovely yard with fruit trees. This home has been gently lived in only 5 months a year. The two car garage has plenty of room for a golf cart too! 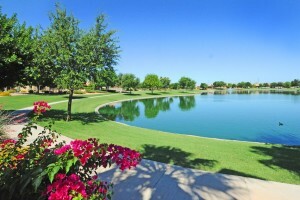 When you buy a home in Sun Lakes, Arizona, you are buying a lifestyle with resort amenities. Oakwood is part of the IronOaks homeowner association with Ironwood. Oakwood features three 9-hole golf courses and Ironwood has one 18 hole course. You can enjoy 45 holes of golf within a golf cart ride of your home. And, you will find tennis and pickle ball courts, fitness center, swimming pools and spa, billiards, restaurants, walking paths, lakes and so much more. It’s easy to get involved in the community and meet new friends. Join the Sun Lakes Hiking Club or take in a theater production by Sun Lakes Community Theater. Maybe you enjoy senior softball or card clubs. There is something for everyone to enjoy at Sun Lakes, Arizona. If you want to learn more about the active adult lifestyle in Chandler and Sun Lakes communities, take a look at our community video below. Why wait? Call The Kolb Team today for more information about 9333 E Nacoma Dr in Sun Lakes, AZ or any home in the Chandler and Sun Lakes communities. We are active adult community experts and would love to help you find your perfect home. Call us at 480-440-0849 or simply fill out the short form below and we will contact you.